Remember the post I wrote about how Emory was terrified of the Fisher Price Glow Worm? That’s the dish we use to feed our cats. 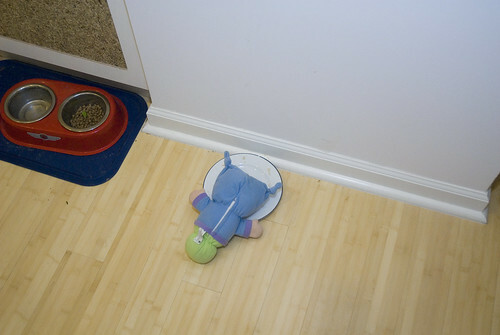 Apparently someone decided that Glow Worm was hungry for some canned cat food. All I know is it wasn’t me and Toby was at work at the time. Glow Worm had a bath right after his meal. i really wanted to respond to your “good ache” post but i think you have the comments closed but i just wanted to say that i SOOOO get where you are coming from. i “go there” at times too, with my husband, daughter, family members and friends… all at different times of course and i’m generally a happy person but i think it made me feel more normal to read that someone else in this world thinks that very same thing… the thing you hope that you will never be around to see happen. i understand completely. Thanks for your comment. I went back and forth on opening comments to that post. You see, I’m having a bit of a difficult time with myself lately—second guessing everything I say, think or do. So I freaked out and turned them off. Weird? Sure. I’m a mess lately! Feel free to leave them on this post. I don’t mind one bit and I hope to have my head back to normal soon enough. Just as a side note, we have been watching some of the Planet Earth series on Discovery. And it is all very lovely and interesting, but the “Caves” episode is rather, er, icky. As you might suspect, it is dark in there, and some not-so-cuddly vermin live there. One of those is the glow worm. Now, I knew nothing about glow worms prior to watching this show, except for the stuffed animal variety, which are cute. Let’s just say that they are really snotty and disgusting and gross and snotty and snotty. My husband and I said, “Ewwwww!” at least a hundred times during the glow worm segment. I now totally understand why Emory has a deep distrust of glow worms. And I don’t for a minute believe that this picture represents him “making up” with the glow worm. I think he was trying to drown him, but he missed the water dish. Just laughed out loud on that one! Thanks!